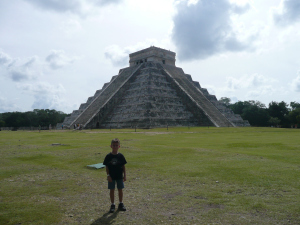 Our second trip to the Yucatan Peninsula (November 2007). Vincent was almost 7 and Dante was 6. Dante running through a 1300 year old market. It’s a hot day today. 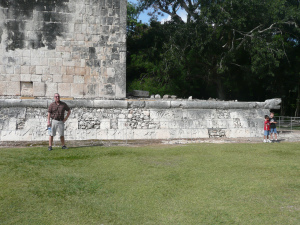 It’s always hot in the Yucatan peninsula. 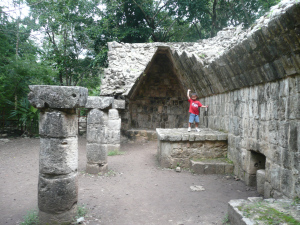 In the car, our way to Chichen Itzá, I lecture the boys about the rituals, culture, legends and every day life of the Mayan era. 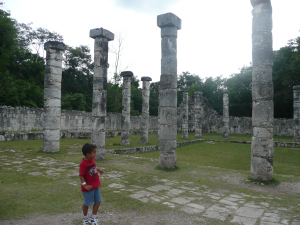 They listen but I doubt they will retain any of this… They are full of energy and after walking around El Castillo (Kukulcán Pyramid), the Observatory, Las Monjas, Casa Colorada, the Juego de Pelota Court (Mesoamerican Ballgame) and the amazing Cenote de los Sacrificios, where I always feel like I’m going to fall in no matter how far away from the edge I stand, we find a quiet area in this marvelous archeological site, where the old market used to be. 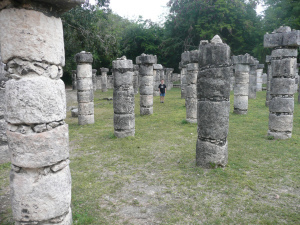 Ancient pillars, all that is left, are before us. There is no one here. The boys start to play hide and seek. I drink water. I hate the heat. Humid heat is the worst. 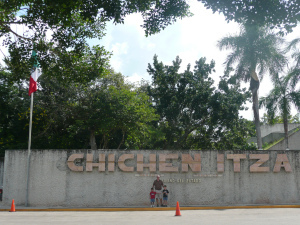 This is our second visit to Chichen Itzá but the last time we were here, Dante was in my belly and Vincent was 11 months old. So I am excited to bring them here now that they are older. 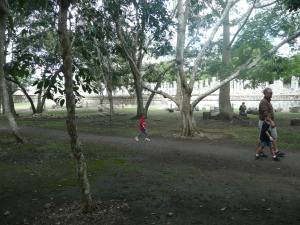 Wayne sits under a shady tree to read a book about the Mayas that he bought at Librería Dante in Mérida. Yes, the same book store where the decision was made to name our second boy Dante when we were here in 2001. 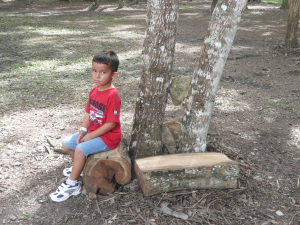 So while Wayne is reading and the boys are running around and hiding and seeking I find a fallen tree and I sit on it. I observe. And I go into my Parallel Universe Historical Moment Mode (I made that up…). I see it. The market in full force. Maya women and men trading and selling and buying. Clothing made out of animal skin, hand woven goods, feathers, stones, jewelry, animals, their daily harvest. I can hear the bustling energy. 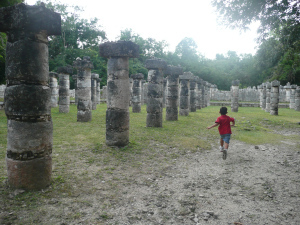 I see my boys running in maya attire, weaving through people. 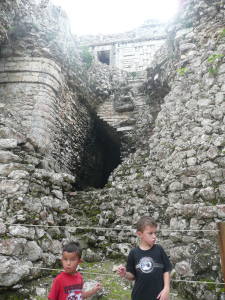 I hear mayan being spoken. A flute playing their ancient songs. Vincent never gives up. He stays hidden. I look a little further where the commoner huts used to be. And I am there. The oval shaped mud wall and dirt floors. The simplicity of their lives. And I feel. 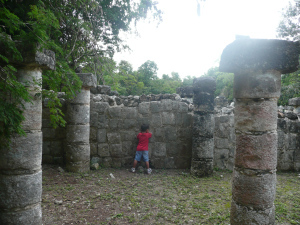 This same dirt I am on, these same plants, these buildings, now ruins, are witness to one of the most important ancient civilizations in the world. My history nerd persona rejoices. This is a mystical, magical place that fills you with wonder and in my case with pride. It makes me proud to come from a country that has such an amazing ancient history. 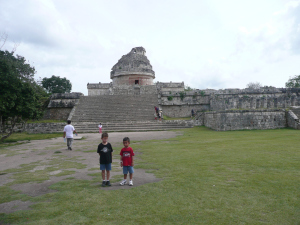 The Mayas lived in this area since 2500 B.C. until the Spaniards arrived at the beginning of the 16th century. More than four thousand years of history! 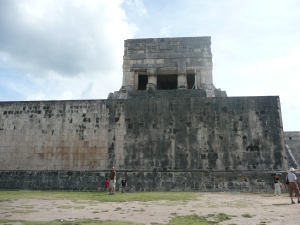 Chichen Itza is one of the new Wonders of the World. 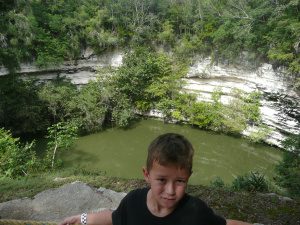 But of course I think all of Mexico is a wonder of this, our One World. El Castillo. 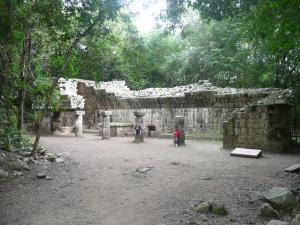 Pirámide de Kukulcán. Tired! 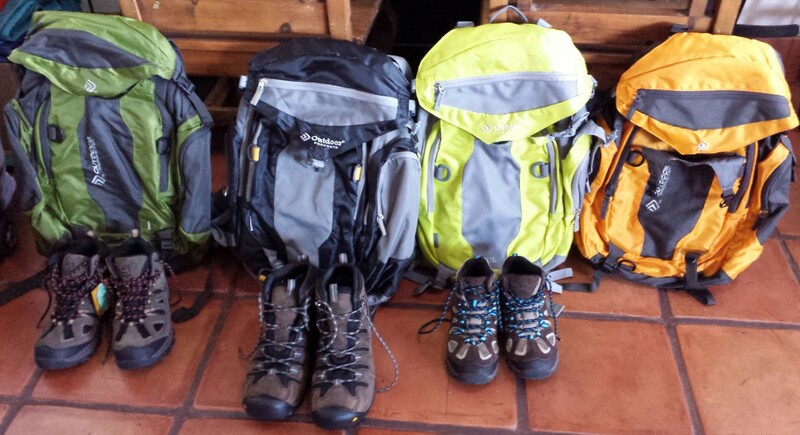 It’s time to go. You are right about the timeline! I was thinking of Toetihuacan. I have changed it to 1300 years which is more accurate. Thanks for reading and correcting me!